BridgeClimb or Sydney Tower Eye & SKYWALK? Whether you're into an adventure, and/or you wish to overcome your fear of heights - this question is for you. If given the choice either between climbing the Sydney Harbour Bridge, or walking on top of Sydney Tower - which would you choose? Why? Would you choice be influenced by either friends or family members? Maybe one of the choices has been given to you through work? If you have experienced both, which one would you prefer? Why? I have been wanting to do the Sydney Tower Skywalk for a while, but I can't find anyone to go with me. I think it is a little more affordable than the Bridge Climb, but I am sure both would be spectacular. They're both fantastic, although BridgeClimb was unforgettable. 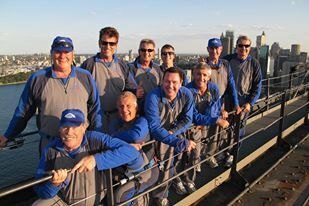 There is more walking on the BridgeClimb. I've wanted to do the Bridge Climb for years. The view just looks amazing and you're in the middle of the beautiful harbour setting, surrounded on all sides. Bridge climb is the touristy thing to do in Sydney. It. Can seem quite pricey but an amazing, once In a lifetime experience. There's nothing like it anywhere else in the world. Amazing views. Best imported chocolate shop in Sydney? Best public christmas decoration in Sydney? Best kid friendly activity in Sydney? Best place to buy jewellery in Sydney? Best organic chocolate in Sydney?